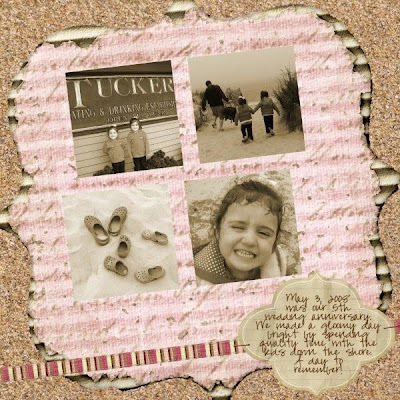 The Curly Wirly Twirly Girlies: Vicki's Soccer Alpha and Layout ! Vicki's Soccer Alpha and Layout ! Well this morning’s email call really put a big smile on my face. Aside from the Irish Lottery I have now won and the person who is concerned I have lost my credit card and will fix it if I send them all the details, I got a lovely email from the totally gorgeous and generous Vicki who has done this fabby soccer alpha for us soccer Mum’s and soccer widows. If you haven’t already grabbed it you can get it from Vicki’s blog. Vicki’s Sports Mini Kit is what actually got my son set on the topic of doing a special scrapbook just about his soccer. He is going to be so excited to see this when he gets home today. I think Miranda might even be altering her layout (see below) to the new letters. I also got an email from LJ at Bella Memorie with a layout using the sand background I did for Bargara. Her kids are so photogenic, I think she is going to be one busy scrapper. I love that shot of the crocs on the sand. They are the details I sometimes miss but really capture a moment. I am layed up with a sprained ankle – I think I have “caught” Vicki’s accident prone tendencies. I did it outside my son’s school at pick up time with the dog and my daughter in tow, needless to say dignity went out the window. Will pack, upload and post the extra bits for that poor neglected caterpillar today. Yesterday afternoon was spent horizontal with a lot of ice around my left ankle and right knee. LOL! Finally got to visit your blog - it's been a busy day. You really made me laugh today ;o) Take care of that ankle and I've heard (ok, made up) that a few glasses of wine are obligatory at times like these! !